emailChecker – Ultimate Email Hygiene!emailChecker – Ultimate Email Hygiene! 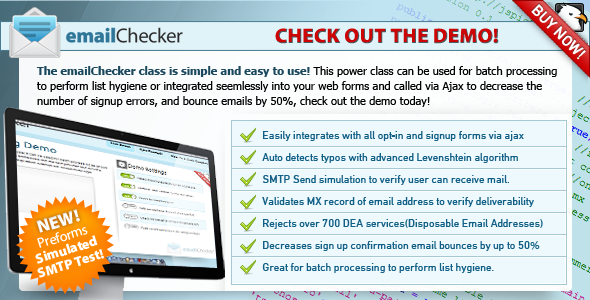 The emailChecker class is the ultimate in usability and improving user experience. Itâ€™s a fact that a huge percentage of your users mistype their email address during signing up, joining mailing lists, and while creating accounts. Studies have shown that using emailChecker you can decrease the number of signup errors, and bounce emails by 50%!